[an error occurred while processing this directive] Dear search engines, please do not link to this web page as it is a secret page. – Thanks, the mysterious authors of this secret web page. This is the web home of secret information about Captain Quillbeard. Since this picture was discovered, mysteriously, wikipedia has begun to use a similar image, probably to help obscure this great secret. 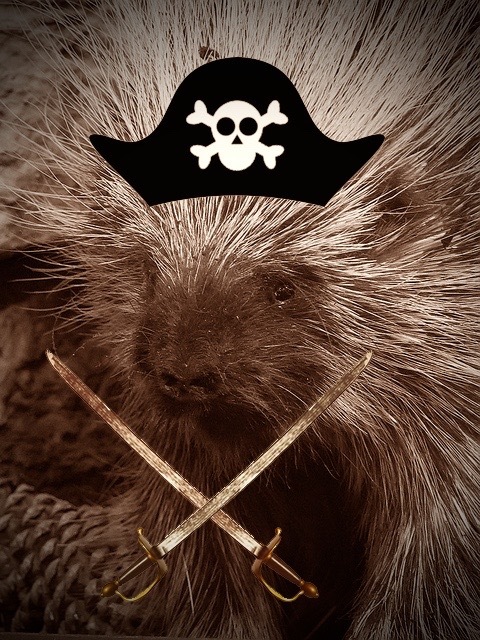 Captain Quillbeard (c. 1628-1653) was a notorious North American Porcupine (Erethizon dorsatum) pirate (piraticus notoricus), and occasional scalawag, originally from Quebec. After discovering a land route to Nova Scotia previously unknown to porcupines, he served as a crew on several privateer vessels. In time he turned to a career in piracy in the Caribbean. His approach to piracy was unique, partly due to primarily using chickens (along with goats and cows) as crew, and partly for his fearsome prowess with the use of catapults to fling marauding chickens and occasionally cows onto ships under attack. He was widely feared throughout the Caribbean. His legendary trove of treasure is still undiscovered, but is rumored to contain the mysterious Gem of Destiny. He eventually was captured by Atticus Fletcher in Barbados. While imprisoned, he mentioned to Fletcher that he had a great treasure trove that he would one day use to do something very important. He died the next day after escaping by burrowing through the floor of his cell and falling into the Atlantic. He was a very poor swimmer. The Gem of Destiny is rumored by some even more secret web pages to hold a great power, though all information is very vague. It’s clearly very mysterious and important, though. This site is optimized for Netscape 3 on Windows 95 on a 133 Mz Pentium or better at 640×480 resolution. If you’re using ancient computers or web browsers, please update to the modern world. Looking forward to find out more about the origins of Captain Qillbeard, since he could be a distant relative to Princess Sherazad from Sorel!